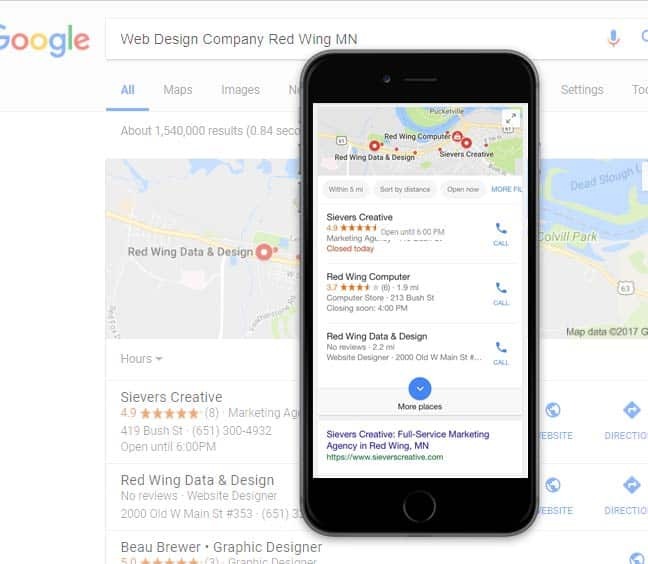 Let Sievers Creative in Red Wing, Minnesota introduce your business to search engine optimization (SEO). This has become an umbrella of marketing efforts, but we assure you that our team is knowledgeable of each facet that we’ll use for your increasing your organic ranking. The main goal is for your website to become search engine-friendly so that when an Internet user searches for a related keyword, you’ll be among the businesses that get first-page results. To make sure that we maximize your website’s capabilities, we approach everything with thorough keyword research, website audit, and on-page optimization. Website overhauls don’t have to be full scale; but if it need be, we will meet the challenge. We’re committed to doing the whole thing right, from the very start. In the website audit, we will identify your website’s strong and weak points, and work to leverage or reinforce these, as needed. We’ll proceed to keyword research and determine which keywords we can build on for your specific requirements. This will be a pillar aspect of your SEO campaign, and you can be sure that we’ll do our best to make you top dog in the keyword battle. And these days, it is a fierce battle! As for on-page optimization, it’s about trimming the fat from your website and introducing internal linking, more impactful copy, and meta data. These will help you fare better in search results, as search queries can vary from person to person. On-page optimization will make sure that there will be more search signals across your website, for your brand to get better results. Content creation, on the other hand, will maximize your website and your blog, should you choose to maintain one. This is an aspect that search engines, particularly Google, really like. It establishes authority for your site, and keeps it fresh through regular updates. As such, customers will see that you’re aware of the latest and the very best your industry has to offer. It all equates to being a solid source, in the eyes of people – and with us, you’ll be able to convert these visitors, into followers, and then into customers. No matter how well you design your website, internet searchers and users will not find it if it is not optimized. With our local SEO services, we can help your site be visible to the people nearest to your business location. While organic SEO helps put your website get on top of the rankings on search engine results pages, a local SEO campaign will further improve how you fare in location-specific searches. Our team employs research-based and industry-proven techniques to optimize your site for local searches. Business listings are a powerful tool for a local SEO campaign. They include all the significant details about your business, such as your name, address, and phone number (NAP). Google and other search engines cross-reference your NAP details across a variety of websites as a way to validate your legitimacy as a business. If you have outdated or inconsistent NAP details online, it will be harder for internet searchers to find your website. Our team will claim all your business listing accounts, and we’ll make your NAP data uniform across all of these. If you don’t have enough business listings online, we will create more for you. We have already mentioned a few examples of off-page optimization, but you need to remember that we must also optimize the on-page content of your website. Our team will alter some of your web content and metadata to make room for mentions of your targeted location. This way, we can make sure that the location we’re targeting is the same, both on- and off-page. Yelp, TripAdvisor, Google Reviews, and other review platforms highly affect local searches. When they’re searching for a certain business in a specific area, users prefer clicking websites with four to five-star reviews than those with lower-rated or no reviews at all. After all, people trust online reviews as if they’re personal recommendations (or disapprovals) made by a friend or a relative. Thus, our team will help you manage all local reviews for your business, from tweaking your Google Business Page to putting your site on other review platforms. The online marketplace is crowded by businesses eager to make a great impression on consumers. Most people now rely on search engines to inform their buying decisions. And a business that’s eager to succeed must go to where the consumers are. Without a solid SEO strategy, your business is practically invisible to online consumers. Without online visibility, you’re losing numerous opportunities to reach out to potential customers. SEO has completely changed over the last few years. There is now an abundance of tools and techniques that allow businesses of all budgets to achieve higher rankings on SERPs. SEO is now regarded as an indispensable and cost-effective marketing strategy driving real, long-term growth to businesses across the globe. We customize our strategies based on the goals and budget of our clients. As a full-service digital marketing agency, our clients benefit from our cutting-edge tools and techniques, proven to propel their business to long-term growth. And because we commit to your long-term growth, we don’t rush SEO and promise instant results. We invest only in white hat strategies that drive real value to your business. More importantly, we are passionate about SEO and helping local businesses grow—in helping you achieve your goals. Reach out to us today to know more about our approach to search engine optimization in MN. As a local agency ourselves, we know the struggles that small, local businesses face when competing in such a dense market. With our SEO services, we can help every business in Red Wing, Minnesota enjoy an increase in their foot traffic and sales, as well.